Are you in need of a small dog bed that can fit your 12-30 pound dog or do you have a new puppy that needs his own pet bed? 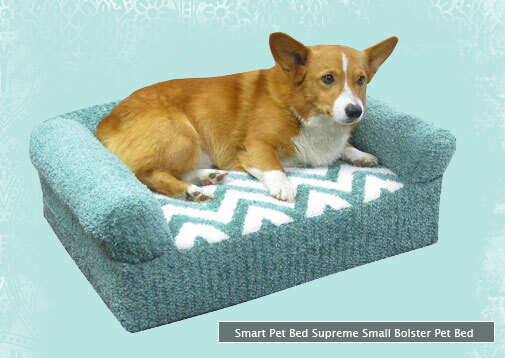 Here's Bailey laying comfortably on a beautiful supreme plush Smart Pet Bed. The fabric covering this small bolster dog bed is washable! And there's a removable memory foam insert including a waterproof liner to protect your dog's bed for years to come. The dimensions of the above dog bed are as follows: 26" x 20" x 6" plus the 4" bolster. The insert consists of 2" orthopedic memory foam with 4" support foam. 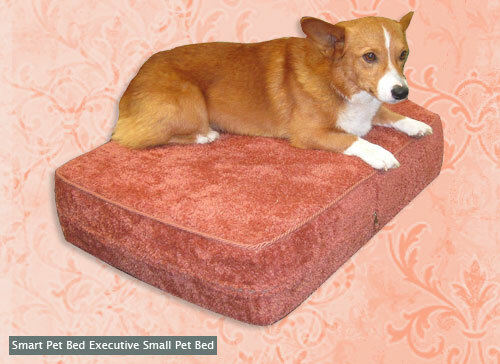 Now, check out Bailey on our executive orthopedic dog bed. The difference between the supreme and the executive is the bolsters, but they both have 2" orthopedic memory foam with the 4" of supporting foam. To view our supreme pet bed collection with bolsters click here or click here for the executive series pet beds. nice foams .. interesting post..